Skills Support for the Workforce is a new scheme to help improve the skills of employees and eligible volunteers working for charities, voluntary and community sector, social enterprises and other not-for-profit organisations in Leicester and Leicestershire. According to 2013 workforce almanac, produced by Skills Third Sector, NCVO and the Third Sector Resource Centre, 15 percent of voluntary and community sector organisations have major skills gaps in their organisations, but 44 percent don’t have a budget for staff training. 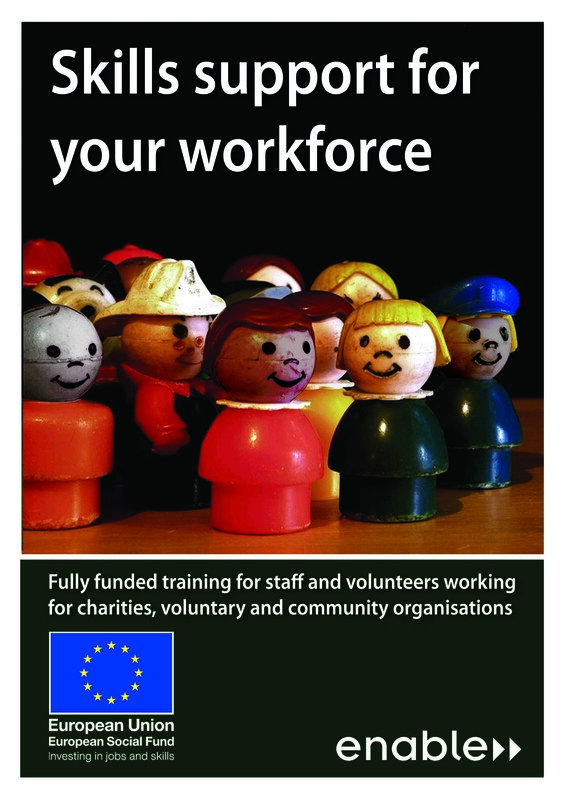 Fully funded by the European Social Fund, this is an opportunity to address this by individuals updating their skills and knowledge and employers plugging their skills gap at no extra cost. Eligible charities, voluntary and community sector, social enterprises and other not-for-profit organisations must be based in Leicester or Leicestershire* with an LE postcode and employ fewer than 250 staff. Learner eligibility is based on where the learner works or volunteers not where they reside. *Please note that the scheme does not cover Rutland, which is covered by the Greater Peterborough and Cambridgeshire LEP, further details of which can be found at www.oneeastmidlands.org.uk/gcgp. ** Any self employed learners need to have an ONA and Di Minimus Form completed. This is to evidence training needs identified and confirm they are a registered company. They will also require their own ERN. Training will be delivered by the project’s college and training providers, who will work with you to develop specific bite-sized training or full qualification’s to fit your individual needs. We are particularly interested in providing training and support for staff and volunteers who have basic skills needs; a disability or a long team health condition; or an ethnic minority heritage, or who are over the age of 50; female; or from a BME community. As of October 2014 the following Skills Support for the Workforce courses were available. Team Building - Team Working for Logistics / Team Working for Hospitality. In addition, capacity building partner Enable has produced a directory of some of these Skills Support for the Workforce courses, which can be download here. *If organisation has less than 50 staff. Level 1 – Learning at this level is about activities which mostly relate to everyday situations and may be linked to job competence. Level 2 – Learning at this level involves building knowledge and/or skills in relation to an area of work or a subject area and is appropriate for many job roles. Level 2 qualifications are at a level equivalent to GCSE at grades A* to C.
Level 3 – Learning at this level involves obtaining detailed knowledge and skills. It is appropriate for people working independently, or in some areas supervising and training others in their field of work. Level 3 qualifications are at a level equivalent to A Levels or Diplomas. Level 4 – Learning at this level is appropriate for people working in technical and professional jobs and/or managing and developing others. Level 4 qualifications are at a level equivalent to Certificates of Higher Education. For further information download the flyer here or telephone Andrew Price on 0115 934 9543 or email andrew@enable.uk.net. The following case studies have been produced on some of the charities, voluntary and community sector, social enterprises and other not-for-profit organisations in Leicester and Leicestershire who have benefited from the Skills Support for the Workforce programme. If you would like to be featured in a case study email information@one-em.org.uk.